***UPDATE: CNET is reporting that Google Barge will officially move to Stockton in the next week or so, though there has been no official comment from officials with the city or Port of Stockton. You can read the story here. Just two weeks ago, officials from the tech giant Google came to Stockton to hold a workshop to help area small businesses create an online web presence. But if rumors are true, Google’s next foray into Stockton will be much, much larger. 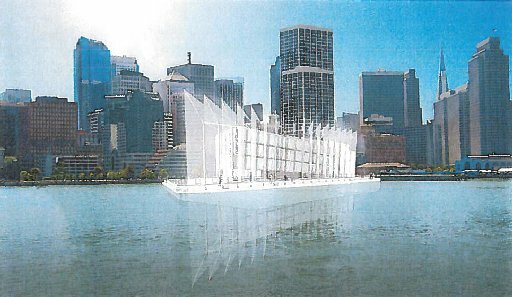 On Tuesday, reports surfaced linking the much-discussed Google Barge project to Stockton. Tech website CNET reports that multiple sources have heard that Google has settled on Stockton as a location. However, Google has not made a final decision, and other Bay Area cities are lining up to woo the barge to their ports, but Stockton is in an advantageous position. The company has decided to relocate the barge from its current location at Treasure Island because of licensing issues required to complete construction, but moving the barge to Stockton would free the company of these restrictions as the city lies outside the jurisdiction of the Bay Conservation and Development Commission (BCDC). The city’s location gives it a clear advantage over other port cities such as Oakland, Vallejo, and Richmond, who have also expressed interest in the barge. Should the rumors be true, it could provide a slight boost for the local economy, which would benefit from construction jobs associated with the project. However, expectations should be tempered. It’s unclear whether the project would bring any highly-coveted tech jobs to the city, which are proven to provide more economic benefits than manufacturing or construction jobs. Moreover, the barge would not dock permanently in Stockton as Google intends to use the barge as a product and Google X showroom, floating the barge to various cities on the West Coast. Still, the move does provide opportunities for Stockton to capitalize aside from construction jobs. The move opens up a channel from the city to tech companies who have probably never considered Stockton. But with Google Barge in town, suddenly Stockton officials have an opportunity on their hands to showcase Stockton’s assets and potential to companies that could potentially invest in the city. In the mean time, if Google decides to berth its barge in Stockton, it would not be downtown at the waterfront, but instead would reside at the port. The Port of Stockton is no stranger to large-scale projects. In the 1950s, the port churned out Mine Sweeper Ocean (MSO) vessels for the Navy, and more recently, several spans of the new Bay Bridge were built there as well. If Stockton is chosen for the remaining construction on the highly curious Google Barge, this would be a great opportunity to leverage positive publicity for Stockton and showcase its strengths, amenities and potential to lure new business to relocate to the city, and spark interest from other tech companies to investigate Stockton’s urban core as a possible location for tech satellite spin-offs. Certainly, this will encompass national exposure that will help cast a new positive light on Stockton’s image to circumvent the years of negative publicity. Thinking ahead, that is if this is in the cards for Stockton, it would be highly advantageous to the city’s best interest to consider pulling out all the stops to also plan in collaboration with Google a red letter festive celebration on the completion and premiere launch of the Google Barge with the presence of the national media before it embarks on its travels. Perhaps this can be in tandem with a Google Tech Fair on the Barge or adjacent to other Stockton venues, i.e. at the Stockton Arena and Weber Point Events Center. This could possibly launch a whole new era for Stockton where the strategy would be to capitalize and position the city as the ‘backyard’ to Silicon Valley, and the next ideal and logical vicinity for expansion of high-tech startups and companies; the “Next Wave”. 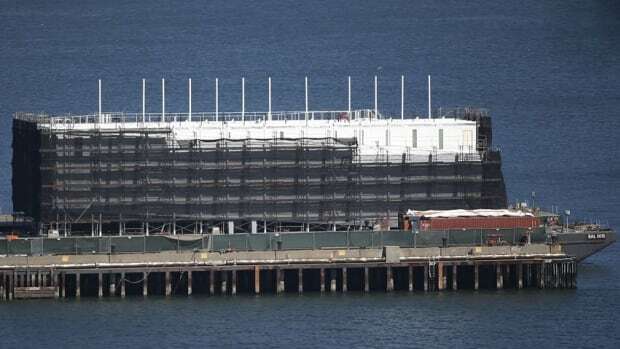 The arrival of Google’s showroom-barge in Stockton does not yet mean much as of yet…but the possibilities are huge and exciting…at least for me and I’m sure for city officials. So far this gigantic tech-company hasn’t made comment about it’s long-term future at Stockton. When thing’s begin to become reality (the barge is literally preparing to float down the Delta now!) it should be the City of Stockton’s single most important topic while discussing future economic activity. The tech-giant must be wooed and courted while rolling out the red carpet and pulling out all the stops in one specific goal: become friends with the giant, Google that is. I’m really hoping Stockton has planned for all of this already. Oh, and it would be nice to see that floating eye candy of a structure in the city! Yes Anthony, no long term plans as of yet with the Google Giant, but the completion of the construction on the G-Barge in the Stockton Deep Water Channel or Port Stockton would certainly be a feather in Stockton’s cap; and who knows what might develop in the near future. I hope the city leverages this publicity to its maximum extent and potential. Here’s another article in PC Magazine on the G-Barge heading to Stockton containing a few more tidbits. I like how these articles so far do not mention the word “bankruptcy” and “Stockton” in the same sentence… actually “bankruptcy” is not mentioned at all. I think this is a very good sign of Stockton turning a corner. It’s so nice to see, albeit Stockton still has a lot of work to do in shoring up its economy on its reparative path to better times, but there seems to be a glimmer of new hope and new possibilities now. I hope this continues. I guess this coming week all the mystery will be solved. But you’ll notice they all quote the same CNET source pretty much, and there has still been no confirmation from the city, the port, or Google. I am hopeful, but I’ll believe it when we actually see the barge docked here.